We meet at 10 a.m. in the Sunday School building. Children ages three (potty trained) through 12th grade attend Sunday School each week at 10 a.m. Registration opens on Sunday, Sept. 10, and classes begin on Sept. 17. Sunday School runs until the Sunday before Memorial Day weekend. Classes are not held between Christmas and New Year’s, or on Palm Sunday or Easter Day. Children join their parents in the worship service during the Peace so families may receive Holy Communion together. Nursery Care is available for children who are three years old or younger. For parents who prefer to remain with their children, please note that the service can also be heard in the Narthex, the stained glass entrance room at the back of the church. The brides room, also located at the back of the church, makes a great changing area and crying room. VBS is a week-long summer camp for kids aged 4 through 10. This very popular ministry fills up quickly. Volunteers are always needed and always have a good time. Come join us and enjoy as we learn about God and His love for us. First Communion Classes meet for six sessions. 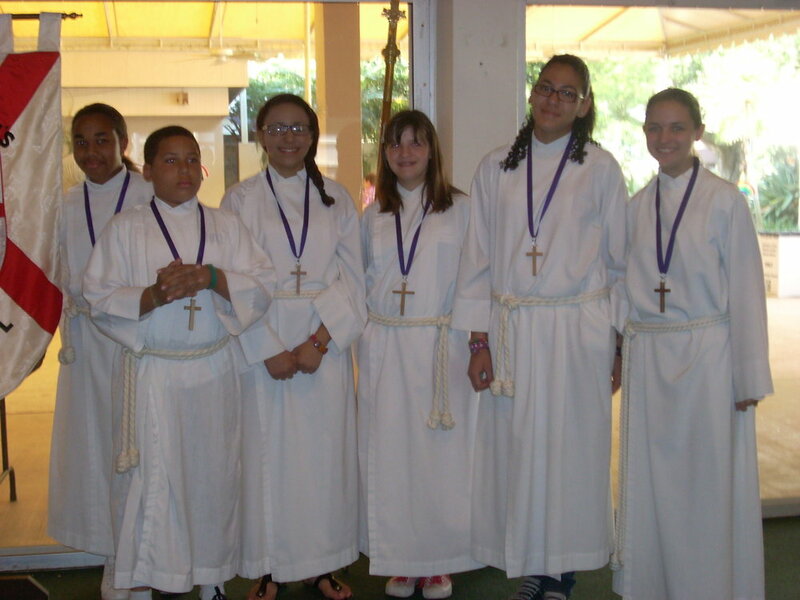 In these classes children learn about the Holy Eucharist and its benefits and responsibilities. Children are encouraged to ask the various questions they have about communion. During one of the classes children and parents participate in an instructed Eucharist. The actual First Communion service will be at the 10 a.m. service on a Sunday in April during Bishop Eaton’s visit to St. Andrew’s.